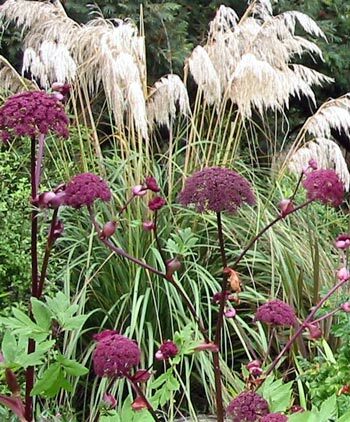 Korean Angelica (Angelica gigas) is a stunning biennial which grows tall (about head high) in its second year and has large purple seed heads in summer. Of all the plants that I have introduced into the Moosey garden this has to be the most stylish. It was originally purchased by mail order - picked out quite by chance as a plant that sounded and looked interesting. I had really no idea how beautifully tall and twisted this plant would grow, and how unforgettable the flowers would be. When the first photographs in flower were taken my family gave it the name 'bee hotel' - the seed heads were covered with crawling bees. I collect the seeds and always try to have new plants growing on. For its first complete year this angelica stays close to the ground - its leaves are tidy and mid-green, and it winters over with no apparent problems. Then the following spring the twisted stems spring to life. They are very sculptural - ribbed and curved just like the normal low-growing shiny green angelica. I am happy to find a few self sown seedlings - these are easy to monitor. Certainly the seeds I collect and sow in the glass-house germinate very easily. 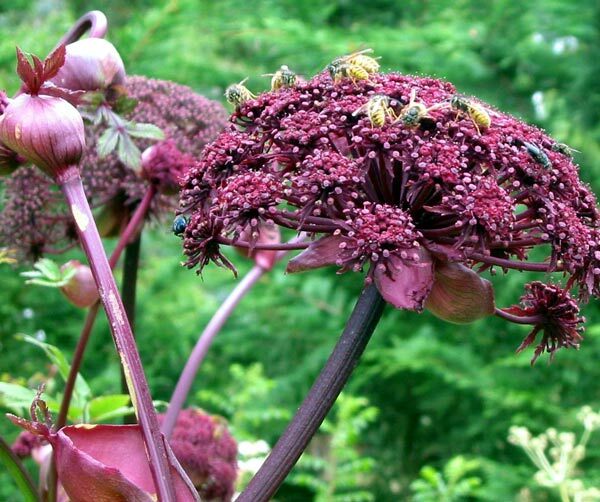 Korean Angelica - a superb bee hotel, one of the best plants in my garden for accommodating both bumble bees and honey bees.